Although California is currently gripped in an unprecedented housing crisis, some relief may come soon thanks to a recently passed housing law that’s reduced restrictions on accessory dwelling units (ADUs), making it easier for homeowners to add second dwellings to their property. 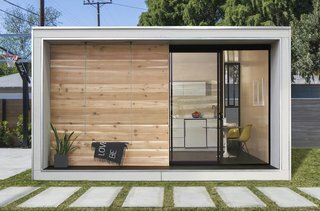 In anticipation of the regulatory reform, Santa Monica-based Minarc has developed Plús Hús, a beautiful and energy-efficient, 320-square-foot prefab that starts at $37,000. "We created Plús Hús because of the need for low-income homes and ADUs," say Minarc founders Tryggvi Thorsteinsson and Erla Dögg Ingjaldsdóttir, who add that although their focus is on the greater Los Angeles area, they’ve received inquiries from across the nation. "We wanted to create a simple structure that would fit the properties in the city." The Icelandic husband-and-wife duo behind Minarc began working on Plús Hús last year but were well equipped for the challenge long before ADU restrictions were reduced. In fact, the design studio opened a fabrication facility in downtown Los Angeles back in 2013. There, Minarc produces its award-winning and patented mnmMOD panels, which are used in the modular structure assembly. Made with 30 percent recycled materials, the Cradle to Cradle Certified, steel-frame panels are recyclable, fire- and termite-proof, boast high R-values, and can dramatically reduce a home’s carbon footprint. "The mnmMOD panel system is versatile, recyclable, and extremely energy efficient, and being from Iceland, we pay very close attention to the relationships between nature, ourselves, and what we create," say Ingjaldsdóttir. "We are constantly looking for ways to do better, and using mnmMOD to create Plús Hús—a simple, efficient, multipurpose structure that capitalizes on these recent law changes while minimizing wasted energy and environmental impact—makes perfect sense." Designed to be set on slab or pile foundation, the Icelandic-inspired dwelling features a minimalist and modern design flexible for multipurpose use, whether it be a guesthouse and Airbnb rental or as a home office and studio. 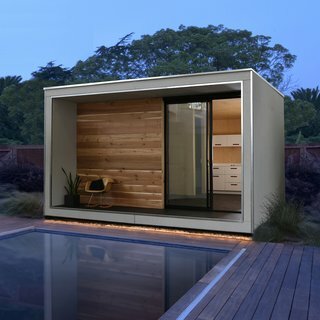 The 16-foot by 20-foot Plús Hús is available in three models: the Plús Hús Open, with three walls and a sliding glass door; the Plús Hús Open+ that includes a bathroom; and the Plús Hús Full, which includes a bathroom and kitchen. 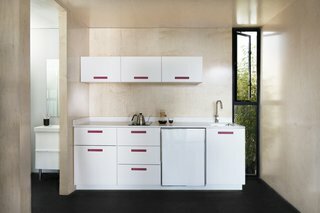 The units are also customizable and offer a variety of finishing materials to choose from. 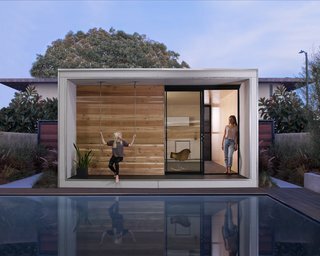 Pricing starts at $37,000 for the Plús Hús Open and goes up to $49,000 for the Plús Hús Full, not including site prep, permitting, delivery, or assembly. When units are ready to be assembled, buyers can either use a contractor or hire Plús Hús for the entire installation process. "I think it’s a great solution for housing needs, especially in California," says Ingjaldsdóttir. "It’s a great investment because of the need for rentals and its ability to create high rental income. Plús Hús is competing with many tiny house companies, but we have a better building thanks to our energy-efficient and mnmMOD panelized system. That’s our niche. Our buildings are built to last and won’t have any problems down the road because of mold or termites." 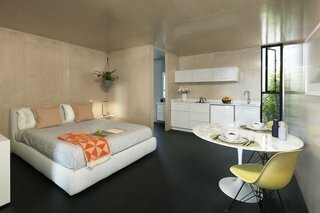 Interested buyers can tour a fully built Plús Hús at the showroom in the mnmMOD factory in downtown Los Angeles. However, although the company delivers anywhere in the USA, their services outside of delivery are presently limited to the greater Los Angeles area.